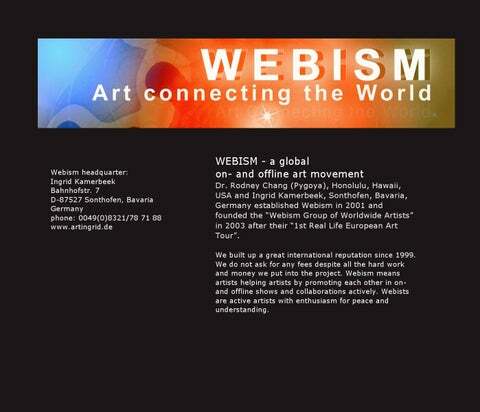 WEBISM - a global on- and offline art movement Dr. Rodney Chang (Pygoya), Honolulu, Hawaii, USA and Ingrid Kamerbeek, Sonthofen, Bavaria, Germany established Webism in 2001 and founded the “Webism Group of Worldwide Artists” in 2003 after their “1st Real Life European Art Tour”. We built up a great international reputation since 1999. We do not ask for any fees despite all the hard work and money we put into the project. 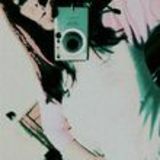 Webism means artists helping artists by promoting each other in onand offline shows and collaborations actively. Webists are active artists with enthusiasm for peace and understanding. Artist Kabucki and Mona Roussette, artist and organizer of the Chaville (Paris) exhibition in Jan 07. Ingrid Dohle Kamerbeek, co-founder of Webism, at the exhibition opening presented Madame Roussette with a lei on behalf of Webism co-founder Pygoya of Hawaii. In this way the Hawaiian Aloha spirit was in the air. Photo shows grandpa at 16 and myself at 28. Both grandpa and dad have been lifelong artists and so am I.
Martin Sambale, eza! chairman and Ingrid Kamerbeek, Webism headquarter featuring the climate change show poster on Nov 27th, 2008. eza! is an energy advice and consulting non-profit agency.